With the cost of retirement communities skyrocketing in the States and Canada, many vibrant retirees are looking outside their home countries for alternative places to bask in the sun and enjoy a cultural yet modern lifestyle. Capitalizing on this growing market of baby boomers, a savvy developer in Portugal has launched the Algarve’s first coastal independent-living project. Those who attended our Global Property Summit in March were among the first to glimpse this revolutionary plan. The lucky folks in the room this month for our Live and Invest in Portugal Conference were privy to the latest updates and last-minute details of this project, with the opportunity to get in on the ground floor. As I write, the pre-launch offer has expired, and the project is going public around Europe and the world. Everything from the project’s location at the highest point in town with the best sea views to its fully accessible unit designs has been carefully chosen for this custom project. 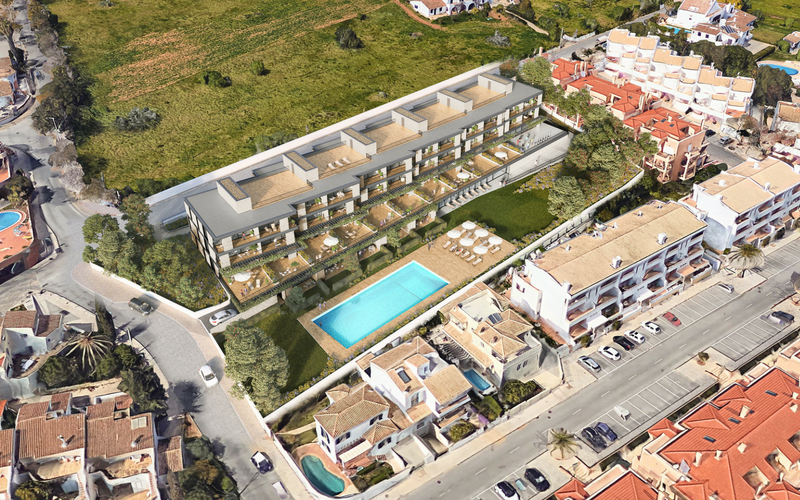 Even the municipality of Lagos has dubbed this development as the most important project in the town of Praia da Luz. 4 poolside units with direct access to the common areas and the ground floor. 4 one-bedroom apartments ranging from 55 to 60 square meters (592 to 646 square feet). The upper terraces will cover 17 square meters (183 square feet) while the ground-floor terraces will be larger with 50 to 100 square meters (538 to 1,076 square feet) of outdoor space. This upscale living environment has been designed to provide luxury living in a community setting. From soundproofing, which is now required by law, to in-floor heating, these fully accessible apartments offer the latest in security and high-tech details. All floors will have elevator access and modern furniture packages are available. Plans feature open kitchens if desired, but owners can also choose a closed kitchen plan. Accessible showers are standard, but bathtubs are also available. Each unit comes with a covered parking space and locked storage area of approximately 6 square meters (65 square feet). A few larger storage spaces are available at an additional cost. The community space includes two swimming pools, an outdoor lap pool and an indoor heated pool, a library, gym, reading lounge, high-tech internet in all areas, solar heating, a roof-top terrace, barbecue, and small community kitchen with beautiful landscaping all around. This project is within walking distance to many restaurants, cafés, shops, a hairdresser, the city center, and one of the best beaches in Europe. Public transportation is at your doorstep, which gives you easy access to everything the town offers. This development is geared toward people who are looking for permanent living options, not short-term rentals for tourists. The social spaces are designed to encourage resident interaction, and the fully accessible designs will allow residents to continue living here even if their mobility declines. By using internal management, the project will avoid high professional-management fees while also providing jobs for locals. There will be no on-site health care provided. The ideal residents are independent and active retirees, however there is no age restriction for investors nor residents. The goal is to have a vibrant community environment year-round, not just during the tourist season. 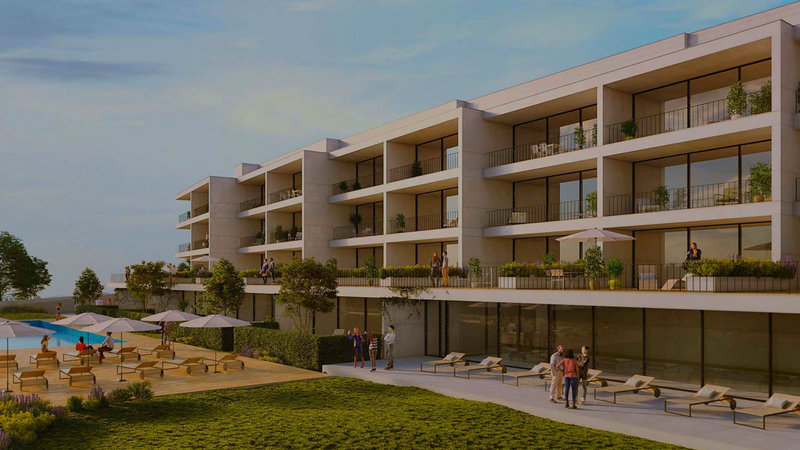 The developer is offering two financially friendly plans for purchasing your dream apartment on the sunny coast of Portugal. The Mezzanine Plan requires 50% of the overall price to be paid upon confirmation of purchase from the buyer. Confirmation won’t happen until the final plans are approved by all regulatory bodies and then by each individual investor. The remaining 50% is paid upon deed signing, which is expected to occur in 2021. The second payment may qualify for financing depending on your personal circumstances. Until final deed transfer, your deposit will earn 6% per year, paid annually in arrears. This financing plan is not available for the one-bedroom apartments. The Staged Payment Plan is based upon the phased development of the project. After the initial 20% deposit paid upon commitment, several 10% payments are made during various stages of construction such as foundation, roof, windows, etc., until the final 20% is owed upon completion. You will not receive earnings on your investment under the staged payment plan. The developer is so confident that you will love this project, he is offering a 100%-money-back guarantee if you don’t like the final plans as approved by all governing bodies. Any buyer may change his or her mind once the final plans are available for review and choose to not move forward with the investment. At that point, the entire deposit will be refunded, no questions asked, less any bank fees incurred for transferring the money. However, if you agree to proceed with the purchase of a unit, you cannot sell your unit until the development is completely sold, and then the sale must go through the development company at market rates and conditions or better. This company has done an extensive market analysis to determine reasonable pricing for this project. They’ll even provide their research to any prospective buyers interested in these details. The overall intention is to keep the prices within market averages while providing a solid base for retaining property values and ensuring growth over time. The pre-launch prices shared with the Global Property Summit and Portugal Conference attendees ranged from 199,000 euros to 410,000 euros. But, of course, this project is flying off the self, so prices are constantly changing. To get the best deal, click here as soon as possible and speak with the developer directly.